Sometimes, you need to express your affection explicitly. So, how about professing your love, care, and affection for your brother on Raksha Bandhan in a beautiful way? Now, send rakhi with greeting cards to your brother on via FlowerAura and let your kind words make him feel loved and adored like never before. It's not every day that you celebrate the beauty of the bond that a brother and sister share. Raksha Bandhan, an occasion that comes once in a year is the day filled with love and wishes that acknowledge the relationship of siblings and marks the beginning of a much stronger relationship. But how do you celebrate the occasion to make sure the memories of it last long? The basic rituals include preparing the Puja Thali, marking the forehead with tikka and tying the Rakhi on the brother's wrist wishing for his longevity and well-being. Well, not just this, the day could also be made special when you gift happy rakhi with greeting cards to your brother as a mark of your good wishes and prayers. You love your brother immensely and is very thankful to him for always being there with you. Right? But, have you ever expressed your love, care, and affection for him? If not, then take the initiative on this Raksha Bandhan and narrate your love for your brother by ordering happy Raksha Bandhan greeting cards from FlowerAura. We offer you a wide variety of exclusive greeting cards for Raksha Bandhan that are trendy and thoughtful at the same time. To order rakhi greeting cards online from FlowerAura, all you have to do is to visit our website, check out our collection of Raksha Bandhan cards, pick a favorite one, and place your order. With the growing competition in the world, people often have to relocate to metropolitan cities in order to pursue better education and find a better job opportunity. So, if your brother has also relocated to a new city and lives away from home then, on Raksha Bandhan just make sure to bring a million dollar smile on his face by sending rakhi cards for brother. This gesture will help you sweeten your bond with your brother and also bring you closer to him. So, on the auspicious occasion of Raksha Bandhan if your brother cannot make it to home then, don't be upset because now you can send your best wishes to him through handmade greeting cards for rakhi. If you are the brother then, you can do the same for your sister and make her feel loved on Raksha Bandhan. If your sister lives away from you and you both cannot make it to celebrate the occasion together then, you can send Raksha Bandhan cards for sister to express your love for her. 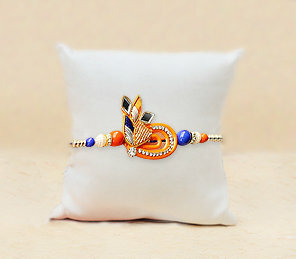 To strengthen your bond with your sister, we have also brought you a wide variety of meaningful rakhi gifts for sister that are sure to be loved by your sister. From customized mugs to cushions, branded cosmetic gifts to spa hampers, delicious chocolates to jewelries, we have everything available at FlowerAura to brighten your Raksha Bandhan celebration like never before. More often than not, you might move to some other city or your brother would as you both grow up. And this could lead to lesser communication and sharing of memories. But you always have an option to send well wishes with Rakhi to brother and let him know that you care for him. You might not always be able to express your true feelings to your brother but there are times when we definitely need to convey our emotions to people who matter to us. When you send e rakhi cards online for kid, he is sure to feel overwhelmed and a lot loved than before. We have a wide variety of Raksha Bandhan e-cards that are meaningful and are designed with beautiful quotes printed on them. To your brother who lives away from you, send meaningful Raksha Bandhan greetings card for brother and leave him surprised. So, go ahead to order cards on Raksha Bandhan from FlowerAura and enjoy free shipping. Since you have been ardently looking for best Rakhi and free raksha bandhan cards for brother and sister, you have landed at the right place. FlowerAura brings you its exclusive happy Raksha Bandhan cards collection so that you can send Rakhi with wishes cards to your brother and have him reminisce the good old days of childhood. Not just this, FlowerAura has for you a lot more to bring a beaming smile on your dear brother's face. With Rakhi and sweets gift combo, infuse sweetness in your relationship despite the distance. With a wide assortment of Rakhis and gifts to choose from, you can easily make a pick and have it delivered at your brother's doorstep. Not just this, FlowerAura values every relation, every emotion. That is why, with its varied range of Rakshabandhan Collection, you can easily send Rakhi with handmade greeting cards for Bhaiya and Bhabhi and celebrate the bonds that mean to you. FlowerAura has a strong delivery network across 170+ cities. So no matter where your brother and sister in law reside, we can always reach out to him with the most scintillating gifts. With an ease to send Rakhi gifts for brother and sister-in-law along with some amazing hampers, express your emotions beautifully that are sure to remember for a long time to come. So this Rakshabandhan, send smiles to your brother and let him know that you love and respect him a lot more than he would ever know. Show him your affection with stunning gifts from FlowerAura.